Susan Boase tells a touching story about a neglected dog who luckily finds himself a better home with a widower. “He didn’t start out lucky.” The black and white illustrations depict the dog’s life with a family that considered him an “afterthought” and “had no time for him.” The descriptions and drawings portray the dog’s loneliness and boredom as well as the casual neglect that might be found in a busy family that does not include their pet as a part of the family. They feed him plenty but offer little else- not a bath, not admittance into their home (he has a fenced yard and doghouse), not even a name other than Boy. Fortunately, Mr. Miller, the next door neighbor, plays the unwitting hero by providing Boy the care and attention a dog needs, true companionship, a real home, and even a real name: Lucky Boy. 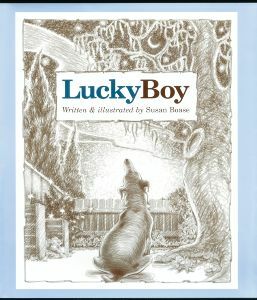 The key to the relationship between Mr. Miller and Lucky Boy is the statement, “You and I are lucky to have found each other, Boy!” The author cleverly shows that Mr. Miller gains as much as Lucky Boy when they become friends and that the family never realizes or appreciates what Lucky Boy offers. For animal lovers and activists, the family’s neglect would raise hackles but I feel like the author was accurate in the descriptions. That family could easily describe the many families that go out to get a dog but don’t have time to walk him or take him anywhere. The tone the author takes is a gentle criticism of the busy lives of families which to me, makes it more effective than painting them with a black brush for their neglect. Thank you for the lovely review of Lucky Boy. You hit the nail on the head with your appreciation of my “gentle criticism”. We are all too busy in our lives, and it takes time to show care and affection for any creature. But the choices we make every day create the world we live in.